In times of austerity we often reach for the budget brands and keep an eye on the pennies. It’s sometimes hard to part with money for expensive beauty products, simply because we can’t ‘see’ them or hold them as part of an outfit – it’s much more satisfying to spend £20 on a new necklace than lipgloss. However, investing in a few key luxury items can really make a difference to your routine and the way you feel; carrying around a decadent lipgloss or truly effective concealer can make you feel like a million pounds. 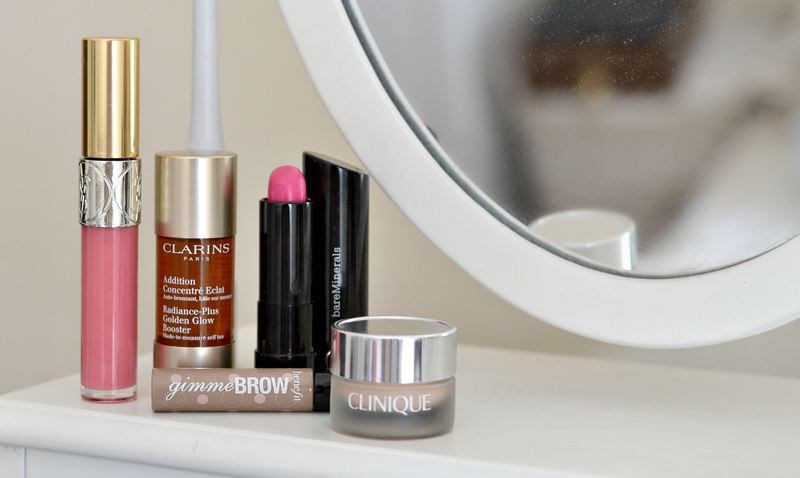 Here are five premium makeup products I really think are worth investing in this summer. Yes, it’s just a lipgloss – but it’s an epic and beautiful lipgloss. This beautifully packaged lip product hides a lightweight and non-sticky formula that adds just a hint of shine to lips, helping to provide the illusion of a bigger pout. The kiss-shaped applicator helps to load the product on precisely, without overloading the lips or wasting product. You’ll feel like a princess every time you pull this out of your bag to re-apply; definitely worth a little payday splurge. I’ve written about this wonder product before, but a few drops of this glow booster into your night cream or serum will have you waking up with a natural glow. I love that it allows your tanning routine to be personalised not only to your skin tone, but to your need – you only have to adjust the number of drops for a lighter or more intense colour result. This bottle may seem like a heavy investment, but it will last you all summer long without a problem… Way more cost effective than five bronzers. Available in 18 shades, including my fave pink shown above, these lipsticks are no ordinary bullet of colour. The formula is creamy and smooth, allowing the bullet to glide over lips and provide a super comfortable finish with incredible pigment. Each lipstick contains minerals, fatty acids and vitamins to help protect and nourish your pout while providing amazing colour; these don’t dry the lips or cause that tight sensation. These are the only colours I can wear all day long without hessitating to re-apply: it’s like a lip balm mixed with a lipstick. As a brow fiend and a lady that can’t leave the house without filling them in, this little tube is a godsend. Unlike pencils and powders which can look too ‘done’ and obvious, this gel formula provides a subtle touch of colour while tiny fibres help to actually fill out the brows too. You apply it with a mascara-style wand, which means you tidy your brows and add definition at the same time as adding a touch of colour. Available in an incredible twelve shades (practically unheard of for a concealer,) this is a pot of wonder. Not only does it help to cover imperfections, dark circles and blemishes in seconds, but it also helps to brighten skin over time thanks to the inclusion of Vitamin C actives. It’s non-cakey and works perfectly with any kind of foundation, providing pretty heavy coverage without feeling too much. Word on the street is that this is heading towards being discontinued (NO!) so I’d stock up while you still can. Do you have any premium makeup favourites you couldn’t do without? I prefer unsweetened almond milk over soya (less calories) and I use almond butter too. Great Post!